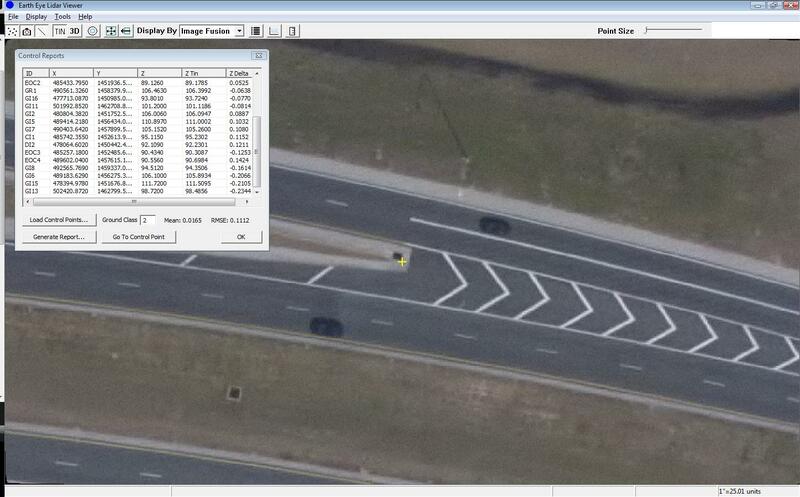 The way we check this is by loading the ground control and LiDAR data into our data viewer and then running a control report against the data. Basically, we’re intersecting the ground control with the TIN model of the ground class of points. The Z values are checked against one another and the difference is calculated. 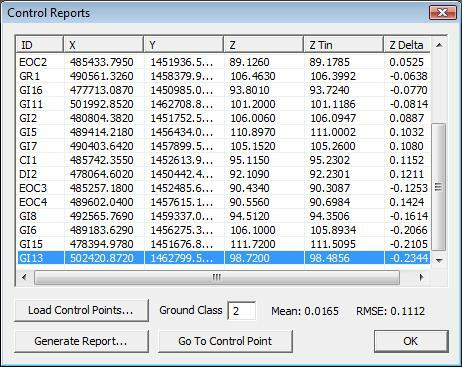 These results are then used to create an RMSE for the project based on the control results. This is a good way to get an idea of how well the data has been calibrated in terms of absolute accuracy. Once we get a control report, we typically sort by the worst result and then start examining the control and the surrounding terrain. The graphic below shows how we can sort the results and then “Go To” the control point in question. 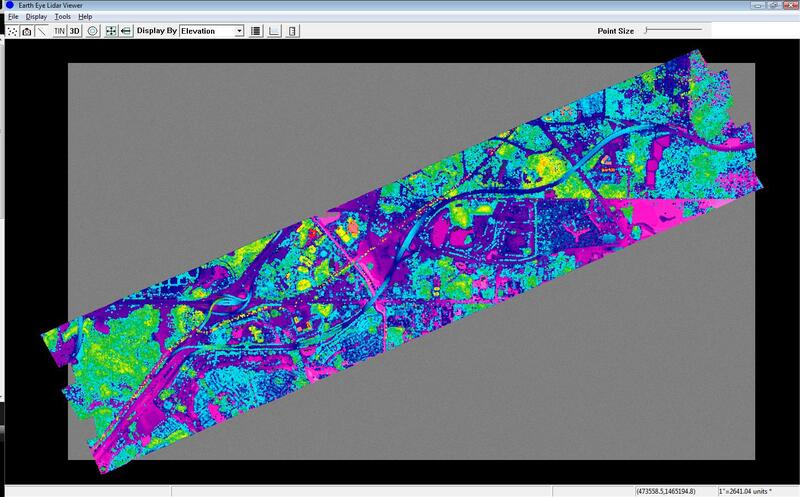 We can see how the point is being assessed against the terrain. Sometimes, there is a blunder in the terrain model and we might be able to edit the terrain to make sure it is the true ground surface. 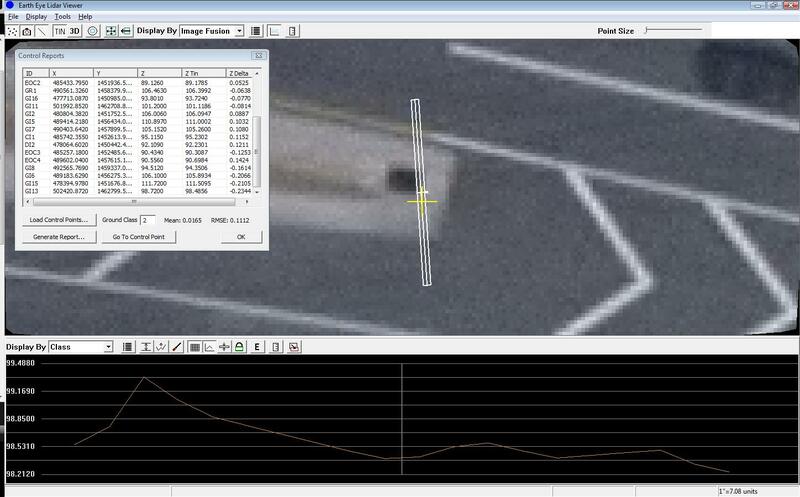 Elevated objects such as trees can influence the accuracy assessment, but sometimes, it might be as subtle as a gutter drain, as seen in this next graphic. The profile view of the drain cross-section shows how the terrain is influencing the accuracy assessment.